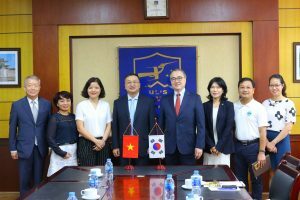 On August 22nd, 2018, the University of Languages and International Studies – Vietnam National University, Hanoi (ULIS – VNU) held a meeting with leaders of the Kookmin University (Korea). The meeting was attended by Dr. Do Tuan Minh – ULIS’s President, Dr. Tran Thi Huong and Nguyen Thuy Duong – Dean and Vice Dean of the Faculty of Korean Language and Culture, Dr. Hoa Ngoc Son – Dean of the Faculty of Language Education & Professional Development, MA. Mai Van Hoa – Vice Director of Cooperation and Development Office. From Kookmin University, Dr. Ji Soo Yu – President of Kookmin University, Lee Dong Eun – Vice President of Kookmin University and representatives of departments of Kookmin University took part in the meeting. At the beginning of the meeting, President Minh extended his greeting to President Ji and representatives of Kookmin University. He also expressed his great delight to have such meeting with the leaders from Kookmin University after effective cooperative activities between the two universities so far. President Ji extended his thanks to ULIS for a warm reception, especially from President Minh. He said that Vietnam and Korea had a great cooperative relationship on many aspects over time. Thanks to the similarities in culture, Korean teachers always feel a close bond with Vietnamese students. His gratitude went to the Faculty of Korean Language and Culture as well as the Faculty of Language Education and Professional Development for sending many Vietnamese students to Kookmin University for academic purposes. He committed to paying a special and whole-hearted attention to ULIS’s students. 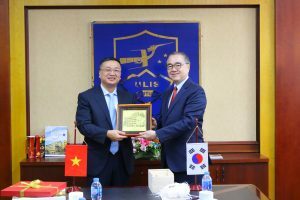 At the meeting, President Minh believed that with the effective cooperation between ULIS and Kookmin University in the past, the two universities would have an enormous potential to cooperate and develop together down the line. He was also impressed with the two slogans of Kookmin University at two different periods, “University for the Nation” in 1946 and “University for the world” at present. President Minh affirmed that the relationship between the two universities ​​will lay a soundest foundation for Kookmin University to expand their cooperative relationships with other universities in Vietnam. 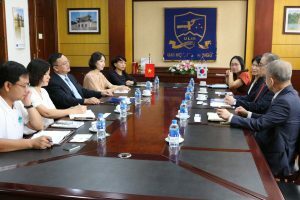 President Ji invited President Minh to visit Kookmin University in the coming time to further promote the exchange activities between lecturers and students of the two universities. President Minh accepted this invitation with happiness. The meeting ended in a cheerful atmosphere with numerous expectations for the upcoming cooperation between the two universities.